Over the Air is once again being held at Imperial College London. We would particularly like to acknowledge the support of the Dept. 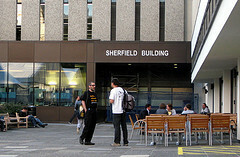 of Computing and the Mobile Applications Centre at Imperial College. The Mobile Application Centre is an initiative to establish a research and development centre for inter-disciplinary mobile applications at Imperial College. The Centre aims to bring together talent, expertise and engagement from across Imperial College to work with partners in academia and industry in developing innovative and pioneering mobile applications. Go to the Directions page for the map. ← Lead a Session at Over the Air 2010!